Based on these standards, the program seeks to train professionals with knowledge in the main functional areas of the organization and provides scenarios for the development of managerial skills based on various methods and teaching formats that facilitate the construction of knowledge within a framework of collaboration and relationship among its participants. The graduates of the program are creative professionals, innovators, transformers, and strategists, who through their developed skills are able to consolidate entrepreneurial and innovation opportunities for the region and contribute and participate in the development and internationalization of companies. The program is a pioneer in Colombia with a long history since 1973 and is in a permanent process of maintaining and achieving standards of management education of the highest quality in the international arena. Duration of 3 semesters, face-to-face classes every two weeks, high support in virtual activities, and a high emphasis on experiential learning, suitable for the student interested in combining work activities with the MBA study. The international focus of the program allows the student to develop the knowledge and skills necessary to act as a manager in the international arena. 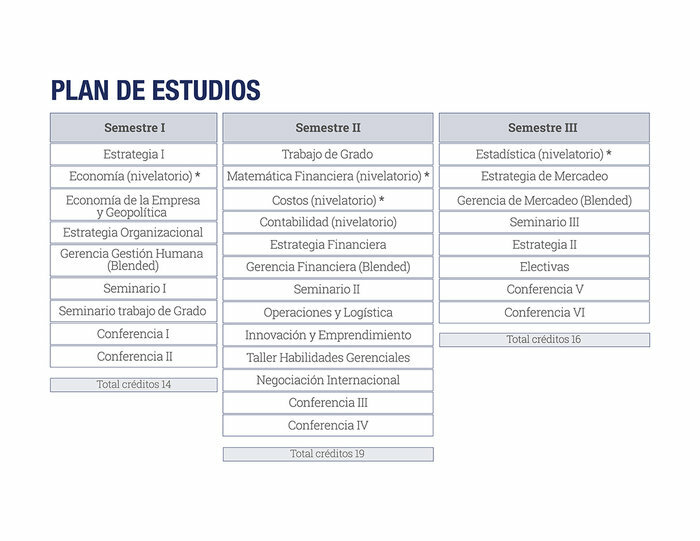 * According to the alternatives offered by the ORI. The program trains highly competent professionals to perform in the various fields of managerial activity. Also, their training will allow them to occupy positions as directors, consultants, advisors, among others. The graduates will be professionals who will strengthen the business fabric, contributing to the development of their regions and the country through the skilful combination of their analytical and creative capacity, the decision making and execution of corresponding actions, the formulation and development of innovation and entrepreneurship projects , and relationship and collaboration skills. On some occasions the Saturday classes can be extended until 1:30 p.m. The School of Management of the Universidad EAFIT , is a symbol in the process of executive training in top management programs, being highlighted as one of the best business schools in Latin America and recognized as the first in Colombia to offer the Master of Administration (MBA) from 1973, trajectory that speaks of experience and prestige, which has managed to position the program among one of the best in our country.